3rd chapter of the week. Enjoy! Special offer only had 3 days left. The trigger explosives could explode in just three seconds. During that time, Magneto had many solutions to the problem: he could create a large iron plate to block himself, he could also make the oversized iron lance directly impale Shen Yi, or use that piece of iron flying carpet to take himself away from the danger zone. But either way, it required him to spend at least a second. In this time period, all Shen Yi needed to do was just press the button. Even worse, he was too close to Shen Yi. The next moment, his finger twitched slightly. Facing different enemies, choose a different weapon, Shen Yi made the most correct choice when not using a gun or dagger. “So now I can not attack you with anything on you and in my hand, and if I move a larger metal object over there, it will definitely take a few extra seconds for the object to fly, which gives you a chance. Is that right?”, Magneto asked. Hearing this, Magneto knew there was no need to question anymore. “You’d better think clearly, I am offering peace.” The voice of Magneto held a faint hint of anger. The person in front of him was really arrogant. Did this man really think he would truly be afraid of such a small packet of dynamite? “Giving up … is equal to death?” Magneto stared Shen Yi. The impasse was still continuing. Magneto and Shen Yi’s confrontation, two people’s expressions are easy, but everyone knows that it was just calm on the surface, but their hearts were already choppy. Not far behind Magneto, came two men and two women. The bald white man who just shouted was one of them. “I believe your reputation.” Shen Yi back to take a few steps, holding Jerry’s hand. “What?” Shen Yi asked back. “No, he isn’t the kind of person I need to deal with, speaking to him is easier than you.” Shen Yi laughed. “I think so, but unfortunately we can’t resist …” Shen Yi sighed. His words were very sincere when he said these words. Magneto was dumbfounded, Shen Yi and Jerry has already quietly gone away. Looking at their backs, he didn’t move a finger. Not far from him, the two men and two women came over. “Nia, look at the origins of this man.” Magneto suddenly exclaimed aloud. “What I want to know is where he comes from, where will he go, what is his goal in the end! 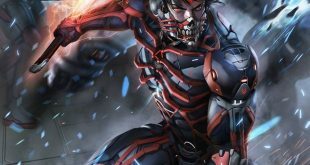 I do not want to know how many mutants he personally killed!” Compared with the performance of the polite old man who had previously talked with Shen Yi, the current Magneto was more domineering. Nia’s Psychic Power was Retrospective, it could accurately trace any person’s past, and even some of his future fragments can be seen. Although this ability has great limitations, such as can only see some inconsistent memory image, but to explore a person’s origins, it was still effective. It had only failed this time when she used it on Shen Yi. Magneto’s heart felt a trace of fright as Shen Yi’s words still echoed in his ears. Shen Yi pulled Jerry’s hand and left in a hurry. No one noticed that his back was coated with of sweat. Although Magneto did not do anything to him from beginning to end, the immense sense of pressure from this powerful BOSS was unprecedented. Magneto always faced his threats calmly, this kind of calm had a fundamental difference with his previous calm, that came from a strong self-confidence. This made Shen Yi suspicious of the fact that the explosives could effectively kill Magneto. He thought Magneto let him off not because of the fear of death, but rather because he did not want to be blown up by explosives and lose his image. The main reason was that once the explosives exploded, Jerry would also be covered in its range. Taking into account the influence of Professor X, Magneto would certainly not want to become the reason that made Professor X students die. It was likely that this was the key reason he released them. Fortunately he did not know that no attack from Shen Yi could hurt Jerry now. Shen Yi did not like this guess, but he knew it was closest to the truth. So now that Magneto had said he would chase after him, he had no expectations that his remaining time will be easy..
At this time the Land Rover arrived, it stopped at Shen Yi’s side. “How did you come here so late ?” Shen Yi held Jerry and jumped onto the car. “If Magneto is also considered a small fry, then you can come more slowly.” Shen Yi coldly said. “You dealt with him?” Wen Rou scared. “Do you think God should be good? Or do you think I should explain to him?” Shen Yi asked. Shen Yi continued to recount the events When it came to the point Magneto announced that they will be fully pursued, all their eyes widened as they looked at each other. “Indeed,” Shen Yi answered very seriously. “In fact, it seems the final purpose of the Hidden Quest about the little guy should be to lure Magneto out.” Jin Gang said. “I am afraid that includes Professor X too.” Shen Yi’s words made everyone’s heart feeling cold. Magneto alone was not what they could deal with. Adding Professor X, it would simply be their doom. What kind of Hidden Quest was this, why could it eventually lead to two final BOSSes of this world? When Shen Yi received this Hidden Quest, he had suspected this was Bloody City’s compensation for taking the BUG Jimmy from him. Taking into account the current situation, he had to doubt that this was not only not a compensation, but rather a bloody revenge on the part of his abuse of the BUG. In the end, whether it was reward or revenge, no one made it clear. If it was the latter, then Bloody City was a bit too mean. But Magneto did not attack him instantly, maybe this was just a warning from Bloody City. Anyway, the question was out and everybody was facing a big trouble now. Not far away, Lena’s car had always followed the Land Rover. They also found out that Magneto will soon come to kill them, they all shared the same look at this moment. Since seeing Storm’s power, they understood Shen Yi’s point and gave up the thought of dealing with the famous plot characters. But now the situation had changed, plot characters took the initiative to deal with them. After a moment’s silence, Hong Lang began to look around.